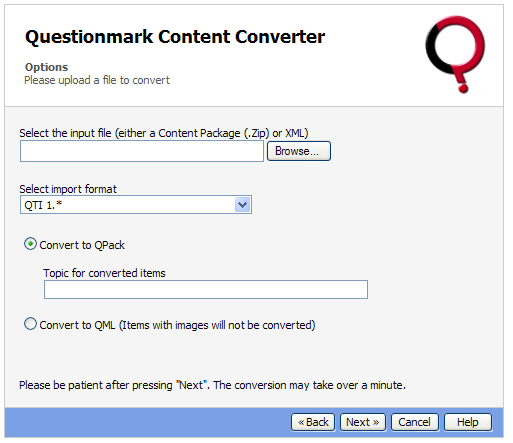 Questionmark has been a long time supporter of QTI XML. QTI XML is a language that describes questions in XML in a way that is platform and technology neutral. Questions take a long time to write, and it’s important that they can survive in computerized form as technology changes. At Questionmark, our customers often need to take questions constructed in an older system, sometimes a discontinued system, and move them into Questionmark software. When the legacy questions are in QTI XML, this is reasonably straightforward. When the questions are held deep inside a proprietary database or other structure, it can be more challenging to move them into another system. Eric Shepherd, Paul Roberts and myself were part of the original IMS team that created QTI XML, and Eric led the team that created and evangelized it for many years. Steve Lay, before he joined Questionmark was one of the leaders of the QTI version 2 initiative. Questionmark as a company is a keen supporter of QTI XML – it’s a good way for our customers to be confident that questions are likely to survive into the long term future. Version 1.2.1 of the IMS QTI specification was finalized in 2003 and is supported by Questionmark Perception and in our Content Converter application . IMS has been working for many years on a version 2 of IMS QTI, and version 2.0 was introduced and finalized, and then a draft version 2.1. You may have seen some controversy recently as the IMS has withdrawn the draft version 2.1 of QTI, removing it from their website saying that they want to review it and change it. Version 2.1 of QTI XML has been in draft form for a couple of years, and although Questionmark hasn’t yet supported it, very many projects have done so, and there is concern from those who have implemented it that their work might not be valid when 2.1 or 2.2 is finalized. See Rowin Young of CETIS’s blog for one perspective on this. 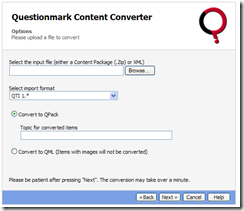 I’d like to reassure our customers that Questionmark continues to support QTI XML version 1.2.1 and will expect to support later versions of QTI XML when formally released as final and open specifications.